DCN 834 was a Guy Arab LUF (chassis number 72143) with a Gardner 6HLW engine, bodied with a Picktree Continental C35F body. Picktree were based at Bensham in Gateshead, near the Northern General headquarters, who had a financial stake in Picktree, these coaches being the last PSVs built by this concern before they turned over to the construction of commercial vehicles. 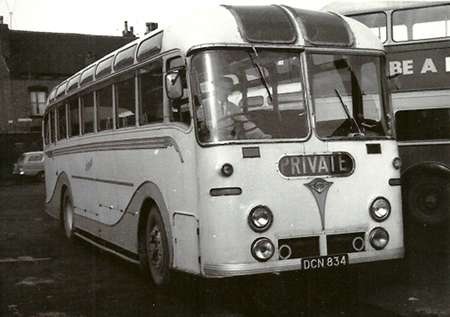 834 was part of a batch of 13 new to the Northern General Transport Company on 1st June 1954, and had fleet number 1534. These vehicles had bold styling and had all the refinements required to undertake their principle duties of carrying 35 passengers in comfort on Continental Tours. During their final days with Northern they undertook local tours to seaside resorts and on local Church and Club Private Hires, before being withdrawn in September 1962 and sold to W. North of Sherburn, who took all 13. A total of 8* were bought by Ledgards, and taken in to stock in January 1963, these being DCN 831/ 834 – 840. North’s put them through the MoT Certificate of Fitness test, before delivery to Ledgards, and obtained ‘tickets’ for 5 years for them. They were painted by Ledgards at Armley Depot and all had entered service from there by April 1963. The coach livery at that time consisted of black roof, cream window surrounds, black wings, and blue panel work, with cream wheels. The final coach livery introduced by February 1964, was sky blue for the wings and window surrounds, with ivory panels, 834, along with 839 were the first to be released in these new colours, as shown in the picture. The picture is taken on the roof of the Armley garage, where so many of Ledgard’s vehicles ended their lives. Does anybody know the name of the Driver? 834 was withdrawn in April 1968 and went back to W. North (Dealer) at Sherburn, from where it was sold, along with 835/6/7 to Minster Homes (Contractor) in May 1968 for use as site offices. *DCN 832 was additionally bought for spares from North’s (via Woods Coaches of Pollington, near Goole), in March 1966, and was dismantled on Armley garage roof, the remains going to Jackson (Bradford) for scrap in August 1967. A picture of Northern General 1532 can be seen at this link. For anybody interested in wanting to find out more about the History and Fleet of Samuel Ledgard they should read the book Samuel Ledgard Beer and Blue Buses by Don Bate. ISBN 095288499. Is the driver really Chris Youhill? No Joe – that’s not me. We only had DCN 831 at Otley depot. However, now you mention my good friend Don’s book, there is a picture of me as a young conductor at the bottom of the front cover – this was as a token of appreciation for my assistance with photo captions and information on aspects of the operations side of the Company. In the 50’s and 60’s, Northern General had a booking Office in Pilgrim Street Newcastle, which was just around the corner from Worswick Street Bus Station. Anyway, I remember that in the window of the shop they had a model of one of these in a glass case. I don’t know what the scale was, but to a young boy of about eight or nine it looked enormous. From other makers models I’ve seen, I would guess it would have probably been an inch to the foot, so about 30ins long. I wonder what happened to it? The driver of DCN 834 is me John Jackson, taken in August 1967. Nice to see you "in print" JJ – if only the good old firm was still around – the happiest days of my PSV career without a doubt !! Chris, what made Ledgard’s such a good place to work? Were the T&Cs better than WYRCC? – I know from my time in Cambridge that Premier apparently had better terms and conditions than ECOC. Geography may have played a part, but surely Armley-based drivers could have found better terms with LCT up the road at Bramley or in the City Centre at Sovereign Street? But then again why drive for Ribble out of Bolton or Hebble, full-stop, when corporation operations in the same town(s) offered better salaries . . .? Did variety of work, or the opportunity of "top-link" work (and associated tips) play a part? Well Philip, any answer to your question is bound to be complex and to vary between individual employees of every grade. So perhaps its best put as a "list." T & Cs – very favourable indeed, and the wage rates were good and generous. When I started there were no sick pay or pension schemes but many other advantages. Duties – comprehensive and interesting with none of the soul destroying "one road and the same mate for ever" system of many of the municipalise and group concerns. We had five depots, each with its own rota and ro9ute systems derived from its origin – built by SL or acquired. Well to be exact four depots, as Ilkley was a "running shed" administered totally from the larger Otley one – a seven week rota of local folks from nearby, while Otley had a twenty week rota – with a little twist !! All twenty drivers moved forward week by week while seventeen of the conductors moved "up the sheet" – the other three conductors were to all intents and purposes always on the Otley local cross town service from Bradford Road (Golf House) to Newall Estate – they all liked it and it suited them with their Ultimate ticket machines !! Variety of work – plenty as most duties involved working on more than one route daily – not all, but most – and the mix of routes was considerable, varying widely between very very busy town services and almost always hectic longer interurban ones. Running times were generally pretty tight, especially with traditional live transmission vehicles and much hilly terrain with frequent stops and, despite the oft heard modern saying "Ah but there wasn’t the traffic around then" there was more than enough to contend with. Rolling stock – now here was the real appeal, especially to anyone with even a trace of interest and enthusiasm. The mix was incredible, with representatives new and previously owned, of a wide array of chassis and body makes, ages and origins – and mainly distributed seemingly "willy nilly" around the depots. Larger concerns might view this as unsatisfactory and often had rigid allocation policies – fair enough if it suited them. Despite this way of working at Ledgard’s maintenance by skilled and dedicated staff was extremely good indeed – most of the heavy work being carried out at Otley and the huge Armley Leeds premises – resulting in the virtually 100% reliable service at all times and in all conditions which the Public have never enjoyed since and a "straw poll" on the streets would certainly confirm this. The local press after the October 1967 SL demise was full of justifiable venom against the new regime(s). Its often forgotten, or perhaps not even known by younger people, that until Samuel himself died in April 1952 all vehicle purchases since 1912 had been brand new, other than those acquired with taken over Firms. When the necessity then arose for multiple reasons, Death duties chiefly, to buy second hand the Executors chose carefully and wisely and only rarely bought a lame duck or, as is the amusing term oft used in the motor trade, a "dog." Chris, thanks for that reply. So was Yeadon a "full" depot then? I’d always assumed it was an Otley dormy shed, like Ilkley. Samuel Ledgard is always presented as the archetypical shrewd Yorkshire businessman . . . but he wasn’t so shrewd as to take the necessary steps to protect his main business interests in the event of his death. That being said he did die at a relatively young age and might not have thought it necessary at that time – and I suppose there are disadvantages in forming limited liability companies. Chris Y – You certainly have a nice and relaxed writing style, which is easy to read, informative, and easy to understand. I must admit (and I am sure others will agree) that I read every one of your contributions to this site because they are so full of knowledge and interest, not just on Samuel Ledgard, as above, but on all aspects of PSV (none of that PCV stuff on here) operations, and history. Long may you continue to contribute and keep me, at least, educated and informed with your wealth of knowledge. For those on here who want to know more about the History of Samuel Ledgard then I would recommend the book, BEER AND BLUE BUSES – by DON BATE (ISBN: 9780952388494), if you are able to find one for sale. Mr Y has contributed, and, (not for the faint hearted) there is even a picture of him on the front cover. Indeed Philip, Yeadon was to all intents and purposes a full independent depot, and was referred to right up to the end in 1967 as "The Moorfield" – officially and among the staff and passengers. The name was of course that of the Moorfield Bus Company taken over by SL in 1934. All essential maintenance and quite heavy intermediate work was carried out there, but major overhauls and recertification were done at Otley. or Armley. The crews at Yeadon, about fourteen if I recall correctly, were a lively set of loveable individual characters – no one more so than "the Reverend Candler" who very sadly passed away en route for a late turn aged only in his early forties. Only very occasionally did Yeadon have to exchange staff with Otley in extreme circumstances – like my Siberian Monday rest day on a split turn with the aforementioned Reverend. Otherwise on Summer Sundays it was routine for Moorfield staff and buses, if available, to be sent on standby to Otley, where literally huge crowds of Leeds (mainly) and Bradford city dwellers needed taking home after a nice day out – sometimes the queues were still large at nine and ten on Sunday evenings, and all were cleared without fail – such was the reliable SL service. Stephen – thank you indeed for your kind remarks which leave me blushing here. I do find it easy to write about the subject, and I enjoy keeping the fading history of the old Firm, and the earlier industry in general, alive where I can. I had to chuckle at your warning to the unwary that my picture (late 1957) on the cover of Don’s book is not for the fainthearted – I’m afraid that a current view if published would have the A & E Departments on overtime !! Don was only saying last evening that its around ten years since the book was published – time flies. I’m surprised no one has picked up on Philip Rushworth’s comment that Samuel Ledgard died relatively young. Born in 1874 and dying in 1952 that made him 78 years of age. I would have thought that a "good innings" for that era. Eric, you are right: I didn’t check my facts – in my defence, my books are currently packed away – and I’d confused the date at which he became licensee of The Nelson . . . which would have made him about ?14 when he put his first char-a-banc on the road! But, it just serves to underline my point: he’d have been 72 when Clement Atlee’s Labour government took power – over the next few years he’d have had plenty time to see which way the wind was blowing on Capital Transfer Tax . . . and yet he did nothing to protect his businesses, despite his age. 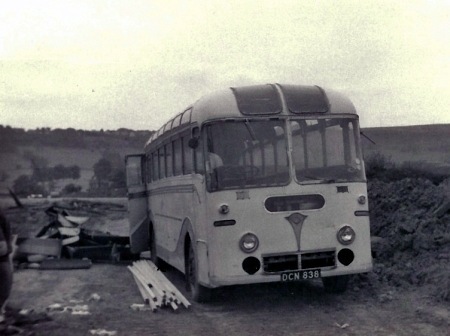 DCN 838 was new to Samuel Ledgard in 1963, it was one of 35 second hand vehicles added to the fleet in an attempt at some sort of standardisation, in order to reduce stocking a wide range of spare parts. 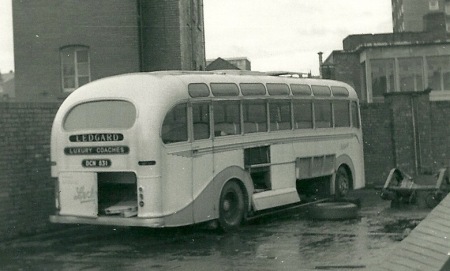 It was new to Northern General Transport in 1954 as their 1538. A Guy Arab LUF – Chassis No LUF 72189 it had a Picktree C35F body. It passed to West Yorkshire Road Car Company on 14th October 1967, upon the takeover of Ledgards by that company. It was never operated by WYRCC. 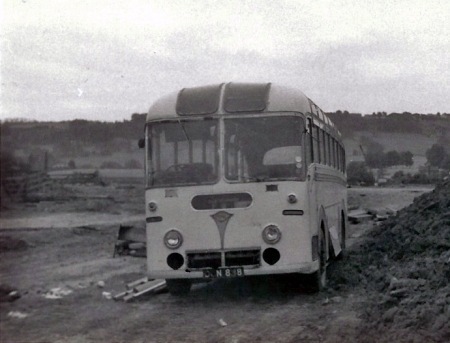 The three pictures show it in a sorry state in July 1968 being used as a Site Office with William Press at Leathley, not far from its home ground. It seems that Picktree Coachworks was founded on 6th September 1947. 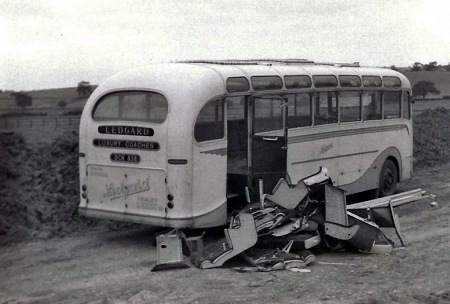 The coach building side of the business tailed off in the mid 1950s – possibly these Guys were the last Picktree bodies of all – and its latter day activities consisted of the sale of motor vehicles. It closed down in November 1996, being fully wound up in April 1998. As far as I can gather, the bulk of Picktree’s output went to Northern General, who also had some curious Picktree bodied AEC Regals known as "kipper boxes" whose chassis incorporated components from older machines. It is certainly probable that the Guy LUF coaches carried over much of the design expertise from Northern Coachbuilders, and they were generally considered to be high quality vehicles. We certainly need Chris Y to give us his valuable insight into their life with Samuel Ledgard. What a sad end for a fine coach These were my favourite Ledgard coaches. They had well appointed interiors complete with aircraft style drop down tables in the seat backs. I had a number of trips on various members of the batch and they were a very smooth riding machine with a very melodious transmission. Just as a footnote to my previous comments. I don’t know when it closed, but Northern had a booking office in Pilgrim Street Newcastle which was just round the corner from Worswick St Bus Station. As a youngster I remember that in the centre of the window they had a model of one of these on display in a glass case. I don’t have a clue what scale it was, but to a boy of about 8 or 10 it looked huge, I wonder what happened to it? What very sad but inevitable pictures Stephen, and so close to the operating area of these fine vehicles too. I am somewhat puzzled though by the theory that they were purchased with "standardisation" in mind, and with respect I don’t think that this was the case. Rather, I think they will have been snapped up as an absolute bargain in mid life highly luxurious coaches on well proven and reliable chassis, and from an operator with high maintenance standards too. There is no doubt at all that they were in superb order when they arrived, and they gave impeccable service. I was a devotee of the old Ledgard original livery of dark blue, cream and black for coaches, and the "DCN"s looked majestic and dignified so painted. The final ivory and pale blue colours were just "not them" and didn’t suit their traditional and individual styling at all I’m afraid. We had eight of them, DCN 831/4/5/6/7/8/9/40, and DCN 832 was bought from Wood’s of Pollington for spares only. DCN 831 was at Otley from Day One and was a joy to drive – Chris Hough so rightly says that they were smooth riding (exceptionally so) and the transmission was quietly melodious – in fact these coaches simply oozed refined quality. I was once sent to the Morley Street stand in Bradford to work a half day excursion to Bridlington (such outings were legion in those happy days) where the manager, Mr. Tom Kent, was supervising the loading. Any prospective passengers viewing the chrome and glitter of the opposition companies were quietly informed with a gesture to 831 and "Nice seats here." By departure time the Guy was full and off we went – all without exception commented on what a lovely vehicle to travel in, and were very impressed by the Gardner’s competent and swift ascent of the notorious Garrowby Hill twixt York and Bridlington. Returning briefly to the "standardisation" theory, I wonder if this perhaps arose from the purchase in 1963 -5 of the thirty four London RTs and five RTLs – certainly standardisation was the aim there, and they formed by far the largest class of identical vehicles in the Company’s history – sadly our "swan song" in view of the impending doom of October 14th 1967. I have been having another look through a box of pictures and came across this one. It is of similar coach DCN 831, again in a state of disrepair, hope it does not upset you too much seeing it this way Chris. Well Stephen, the entire saga of the demise of Samuel Ledgard upsets me but we just have to put up with it I suppose. The almost unreal proceedings in the week leading up to Saturday 14th October 1967 are still a sore point with enthusiasts and passengers, the latter never having had a truly satisfactory and reliable service since that date. DCN 831, in your latest picture of the near deserted roof of Armley Depot, was of course the vehicle which was always allocated to Otley Depot and, yes, I suppose I am still sad but there we are – the whole nature of the bus industry has altered out of all recognition and that’s that isn’t it ? ?